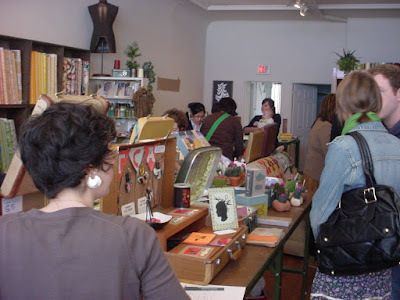 For instance, the last craft fair. Whereas preparing for a craft fair before could feel, well, a little bit traumatic (in a fun way, you know) now, while I'm preparing, sometimes Safiya also makes things for the craft fair. "Mama, I need a needle", "and some felt", "and thread". And off she goes, to shortly return with, "This is for the craft fair, Mama". I've never suggested this to her, it's something she does. There are now various soft sculptures and fabric pictures all over the house, and it didn't click until that last craft fair. I had just been saying and thinking "isn't that cute - oh, aren't they lovely, dear". Good grief, how patronising. Like all kids, she likes to be involved (wants, needs, deserves? substitute your own verb, if you want). During the actual fair, she was making some of her sculptures, when I finally asked her if she wanted to put some of them up for sale. You should have seen her face! She was so excited! We discussed how much she thought people should pay for them, I made a sign, and stepped back (all right - not entirely - I asked my friend Becky to be her first customer because I know how impatient kids are and the sign was kind of small, and she looked so forlorn with no customers ;-) Actually, I didn't even need to step back - Safiya pushed me away! Very seriously, she took command, "Mama, you're in - my - space! 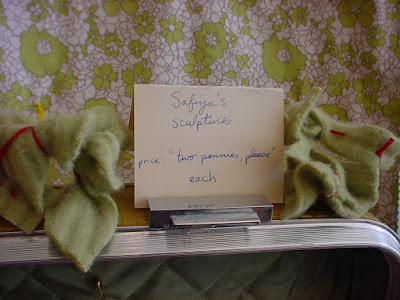 I'm selling my sculptures!" (giving me a nudge each time). Awesome - anybody who thinks attachment parenting is going to create anything but independent minded kids hasn't met Safiya. 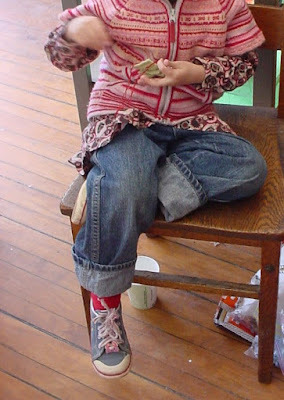 The sweet topping was her understanding that one way to obtain the cool crocheted cactus that she wanted to buy at the fair was to sell some of her sculptures and save the pennies. This is cool. I admit I'm clueless in the matter of kids and commerce (my own upbringing and experience having been dismally misguided in this area) so Mr. S. and I are just hashing it out as we go, but this is a good start, I think. Wendy Priesnitz wrote a great article entitled "Children are People Too", which articulates very well something I hold as essential to being a person (just scroll down a bit on the page, it's her post from May 2). Not a parent, not a mother; a person. I guess the short version would be "we belong together" - and by that I mean people, not just parents and kids - in all areas, in commerce, in restaurants, in everyday life. Not just around the dinner table at the end of the day. We would do better to benefit from everyone in our society, children included, eh? Oh, I love her little sculptures. That's so sweet! Did she get to buy a little cactus, then? Oh my gosh that's so cute! My son is 4 so I could just imagine the "mom your in my space!" thing.